Chelsea & Fulham H.O.G. - Ace Café Dash! Well we chose our shortest ride of the past year to allow the rain to come down! It was a great sight, being tail-gun Charlie, watching the C&F ride fill up the Ace Café parking lot. We Dominated!! We were joined on the ride but the journalist and Motorcycle rights campaigner Ian Mutch. 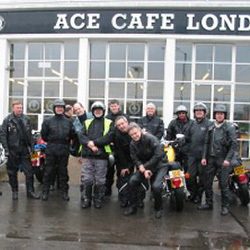 Ian led many of our posse along with bikers from all over London, from The Ace to Pentoville Prison - for the annual Fred Hill memorial ride.